Local Lakewood Musician Eli Baumgarten releases his brand new album Mystic! Your new album Mystic has recently just released. What are some influences that went into your process and development of the album? Mystic is my first ever album release, comprised of songs which I began writing at the age of twelve. In my early years of learning to play the piano, I focused on classical music. As I entered high school I was exposed to jazz. Classic jazz artists such as Wayne Shorter, Bill Evans, Charlie Parker, John Coltrane and Miles Davis moved me to create my own jazz compositions. Then I started to play big band music in the school jazz band (Benny Goodman, Charles Mingus, Jason Robert Brown, etc.) and I ended up getting into modern jazz fusion such as Snarky Puppy and Bill Laurance. All of the jazz in which I was immersed definitely influenced the album, creeping its way alongside the classical sounds with tunes such as Venus and Infinity. The last song on Mystic, called The Teller (which was the last song on the album that I composed before release) was influenced by Bill Laurance's song Smokers Castle. I loved the concept of a simple, driving accompanying left hand rhythm underneath an expressive, melodic line, all blended with complex harmonies. The process of creating a song often starts by whistling a melody or tapping a rhythm to the pulse of footsteps. Depending on the setting, the result of a song can vary greatly. For example, I was in Alaska in the summer of 2017 on a beautiful hike in Seward when the beginning melody of The Teller suddenly popped into my head. Different surroundings tend to elicit varying ideas for new music. 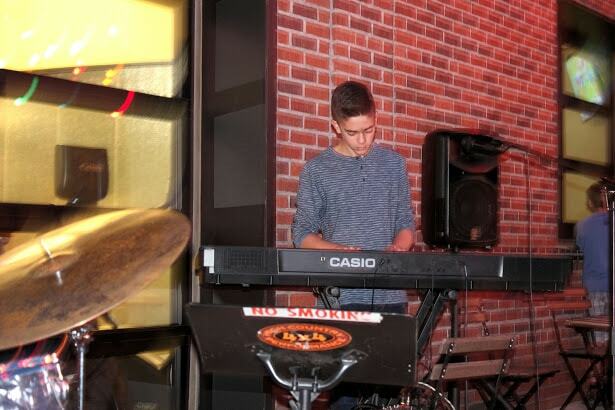 On the contrary, some of the songs on the album such as Astonish, Mystic and Spark were created at the piano. They required more musical development. When did you start playing the piano, and what first got you interested in the instrument? I was four years old when I first touched a piano. I remember one day in preschool; two women were hosting a keyboard class in the library for kids who were interested. I have absolutely no idea why I decided to go, but my four-year-old self walked down to the library and started banging on the keys of a twenty-dollar plastic keyboard. From then on, I never stopped playing the piano. I eventually enrolled in lessons at the Colorado School of Music with my mentor of twelve years, Kirk Vollack. I wrote my first piano song at the age of eight. It was called Skulls and Bones and it was about thirty seconds long. I was quite proud of the composition at the time; I even put it on a cassette tape. Looking back, I realize that although the song itself resembled very little musical genius to say the least, it was the beginning of my passion toward writing music. I love the idea of expressing certain emotions or "scenes" through a piece of music that I have the power to create, balancing musical complexity with general appeal to the ear. Does your family have any musical background? My maternal grandmother can play the piano and sight read fairly well. Other than that, my family has little musical background. While neither of my parents have ever been involved in playing a musical instrument, they do not push me to practice my passion (in fact, sometimes they even ask me to stop playing as I am practicing late into the evening). All joking aside, my parents are extremely supportive. Do you play or practice any other instruments alongside the piano? The piano is what I would call my current "official" instrument, because it is the only one I have spent years studying and learning to play well. However, I am interested in other percussive instruments such as the drum kit. When I write music with multiple instruments, I utilize software that allows me to arrange and produce with many different sounds and effects. Although I only truly play the piano, I have learned a lot about how various instruments fit together in an ensemble and integrate. I am proficient at creating solid bass lines, drum beats (acoustic and electronic), one-line melodies, chord progressions, and auxiliary sounds. I only play the piano, yet I compose for a wide range of instruments. Where and how do you find inspiration for developing your music and creativity? Other musicians and artists perhaps? The most interesting and ironic part of my music writing process is that when I try really hard to write a good song, a lot of times I am not satisfied with my results. Yet, sometimes I can just sit down at the piano and something comes out of nowhere that is catchy and powerful. As one of my favorite contemporary and personally influential jazz musicians, Bill Laurance, said, "Certainly the strongest things I've ever written, I've written in like, ten minutes...it felt like I wasn't really trying." In terms of music composition, this could not be more true, at least for me. The best music I write in my opinion are the tunes that just "come out of nowhere". They feel the most natural. However, I believe it is imperative to write as much music as possible even if a lot of it is not great, because the more you try and fail, the more frequently something amazing will "come out of nowhere". Over the nearly ten years I have been composing music, my style and voice have changed. I first wrote classical piano pieces because that is what I learned growing up influenced by Mozart, Beethoven, Haydn, Bach and countless other classical composers. 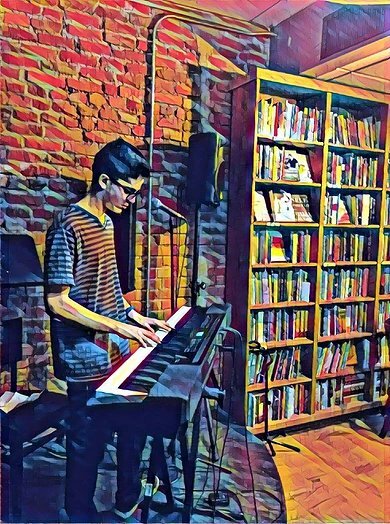 When I was twelve, I began branching out and experimenting with rock and contemporary piano music with influence from Billy Joel, Elton John and even more modern groups such as Linkin Park. Then, at around age thirteen or fourteen, I was exposed to jazz. At first, I did not enjoy most of the jazz I heard and the potential complexity of the genre intimidated me. However, as I began to listen to more contemporary jazz, funk, and fusion, it quickly became my favorite genre. I went to jazz camp, joined jazz band, and learned music theory. I am almost seventeen right now, and the music I am writing is heavily influenced by the music to which I listen. Currently I listen to rap, EDM, dubstep, jazz, funk, classic rock, and endless other genres that all make their way into my own music. I realize that more diversity in the music to which I listen equates to greater improvement in my compositions. There is always much to learn, and there are often ways to develop and become better. What are some tips you might give to others who might be interested in pursuing similar types of music? For others who want to pursue this type of music, I would recommend playing and/or writing as much music as possible, even if the results are not satisfying at times. The more the music fails (and it will), the greater you will grow as a musician because you will learn what works and what does not. Write and play music in as many different styles as possible. If I only wrote contemporary piano songs, my musical perspective would be extremely limited. That is why I write, play and listen to funk, jazz, EDM, orchestral music, pop and essentially every genre I can. This enhances my perspective on music and provides me with a plethora of ideas to incorporate into my own songs. Along with the personal artistry aspects, I would recommend learning as much music theory as possible, and practice ear training (after learning the basics of music such as reading simple melodies). Having a solid understanding of chords, scales, rhythm, melody, etc. will allow you to be expressive as possible in the music you play or compose. The more you understand how music works, the less limited you will be as a musician and the more you will be able to explore. Make sure to play music with other people as well; the more experience you have playing with other musicians, the better you will learn how to communicate musically, play "in the pocket" (locked in), and your solo work will improve too, because playing music with others is considerably more difficult than playing solo. Finally, the last tip I would give to people in pursuit of music is to not be too hard on yourself, and just take a risk. Often times I get so caught up in the mistakes that I hear in my own music that no one else even notices. For example, there are definitely a few mistakes I hear even in the final product of Mystic. However, I chose to release it regardless, or else I would have spent forever trying to fix every single aspect of the album and I would have gotten nowhere. Perfection is impossible, so once a song you are practicing or writing is good enough, perform it or release it and do not dwell on the mistakes.